The price of the cruise also includes dinner and show. As of 2013, Branson Landing Cruise tickets are no longer offered. It is unknown if or when they will be offered again. Experience the elegance of a grand riverboat as you paddle across the surface of Lake Taneycomo on the majestic deck of Branson Landing's Lake Queen. With options including sightseeing, lunch, and pizza cruises, passengers have the opportunity to see historical sites of the Ozarks while a guide narrates stories from the rich history of the Ozarks. This 2,000-acre Branson waterfront area is also home to rare wildlife such as the American Bald Eagle, Night Heron, coyotes, minks, and more. From the antics of the Baldknobbers to Branson's first roller-skating rink, this tour gives a visual and oral history of the beginnings of this great city. The guide will entertain passengers with trivia and historical facts in this fun-filled educational adventure that the whole family will love. 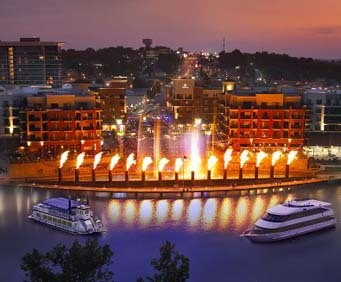 Each cruise will also stop by the Branson Landing Fountains for a spectacular performance. This $7.5 million dollar lakeside attraction synchronizes shooting water, neon lights, music, and pyrotechnics. 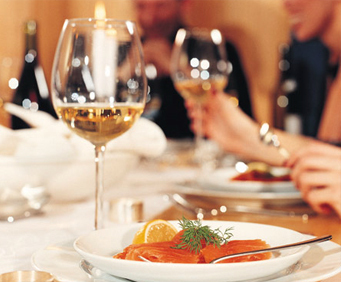 Check out the different sightseeing, meal, and event cruises below. This cruise features all the historical Ozark sites and commentary from a guiding delivering an interactive history of the area. This particular option does not include a meal, but snacks may be purchased aboard during the tour. Cruise lasts approximately 1.5 hours. 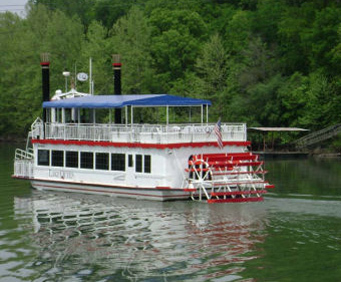 The Lake Queen Lunch Cruise features the beauty of the Ozarks as well as a delicious lunch. The cruise includes narration of the sights and wildlife as well as a deluxe deli lunch. A late-afternoon pizza cruise is now an available tour on the Lake Queen. All the usual sites and narration are included in this tour, but the meal featured will be an all-you-can-eat pizza bar. 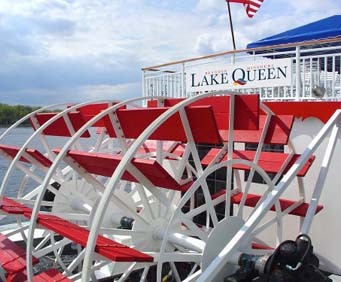 Embark on a fabulous cruise by moonlight aboard the Lake Queen! On your tour, you will enjoy the fabulous night performance of the Branson Landing's Fountain Show, complete with fire sound, water and light. This unique cruise provides excellent photo opportunities, so be sure to bring your camera! Cruise lasts approximately 1 hour. Spend a festive evening aboard the Lake Queen with the special fireworks cruise. Snacks and beverages are available for purchase during this cruise as you enjoy the Liberty Light-Up Display over Lake Taneycomo. Cruise lasts approximately 2 hours. Very relaxing and beautiful. Pilot of the boat was quite a character, enjoyed his jokes and the lunch was very good. I would definitely do it again next time. "This is a very peaceful ride." This is a very peaceful ride. "We enjoyed this very much." We enjoyed this very much. The captain was excellent and very entertaining. It certainly helped that the weather was a1 as well. We have already recommended it to friends.